Cambridge Road in Delaware is one of four roads that will undergo maintenance. Repairs are expected to last through late September. A slew of street repairs have begun around Delaware and are expected to continue through late September. In total, four streets and one bridge will receive pavement or maintenance work, according to a release from the city of Delaware. On Monday, maintenance of Heffner Street began and lasted through Friday (Aug. 6-10). Some parking restrictions will be required as repairs are made. In addition to Heffner Street, Cambridge Road, Winter Street, and Blymer Street will also receive repairs. Hefner, Winter, and Blymer Street will receive a full-width resurfacing, with Cambridge Road being re-paved. Cambridge Road will be paved from Lexington Boulevard through Bridgeport Way, and the work will run Aug. 13-24. The road will be closed to all through traffic during that span, but the release stated local residents would have access to their properties by the end of each workday. During that same span — Aug. 13-24 — the Winter Street bridge will also undergo repairs that will close the road to vehicle and pedestrian traffic during the work. The repairs will include surface and masonry work. The final phase of the 2018 resurfacing program will include the paving, milling, and resurfacing of Heffner (from Euclid Avenue to Sandusky Street), Winter (from Franklin Street to Central Avenue), and Blymer Street (from Lincoln to FountainAvenue). Traffic will be maintained through the milling and paving portions of the repairs. These repairs are expected to begin on Sep. 3 and last through Sep. 21. Periodic parking restrictions will be posted. A total of $1 million will be spent on the crack sealing, new pavement, striping and base repairs. Of that $1 million, $450,000 will come from the City of Delaware. Last year’s program improvements included work on London Road, West Harrison, Moore, and Channing streets. 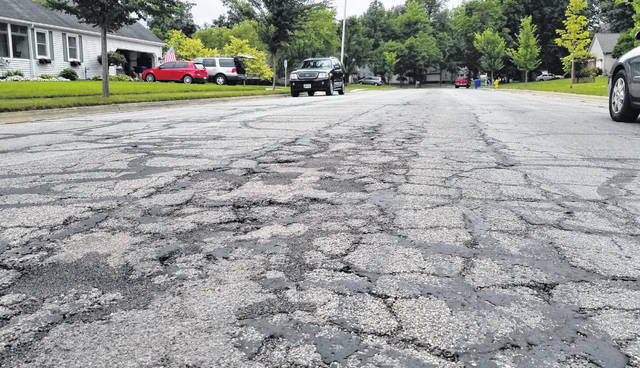 https://www.sunburynews.com/wp-content/uploads/sites/48/2018/08/web1_paving1.jpgCambridge Road in Delaware is one of four roads that will undergo maintenance. Repairs are expected to last through late September.